iOS 4.3.1 Jailbroken Already Using PwnageTool. Here’s A Complete How-To Guide ! The just released iOS 4.3.1 firmware update for iPhone and iPod touch has been successfully jailbroken, courtesy of some swift work by DjayB6 on iOS 4.3.1 jailbreak bundle, and Universal Ramdisk Fixer. The jailbreak though is tethered only for now, which means that you will have to boot it into jailbroken state every time you reboot. Support for iPhone 3GS and iPod touches is on the way ! Simply follow the instructions below to jailbreak iOS 4.3.1 on iPhone 4 using a combination of PwnageTool 4.2, Universal Ramdisk Fixer and tetheredboot utility. There is no unlock for the new baseband on iOS 4.3.1. If your iPhone relies on a carrier unlock, DO NOT update to stock iOS 4.3.1. 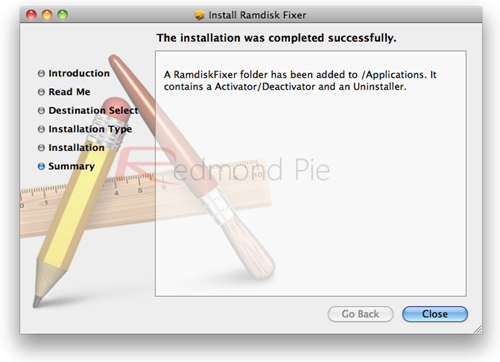 Step 1: Download PwnageTool bundle (includes Universal Ramdisk Fixer) for your version of iOS device. Extract the .zip folder, in there you will find a .bundle file, for this guide, we are using iPhone 4 bundle iPhone3,1_4.3.1_8G4.bundle. Move this file to your desktop. Step 2: Download PwnageTool 4.2 and copy it to /Applications directory. Right click, and then click on “Show Package Contents” as shown in the screenshot below. 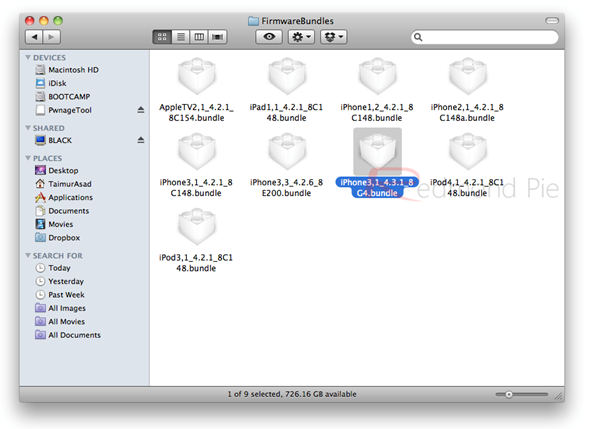 Step 3: Navigate to Contents/Resources/FirmwareBundles/ and paste iPhone3,1_4.3.1_8G4.bundle file in this location. 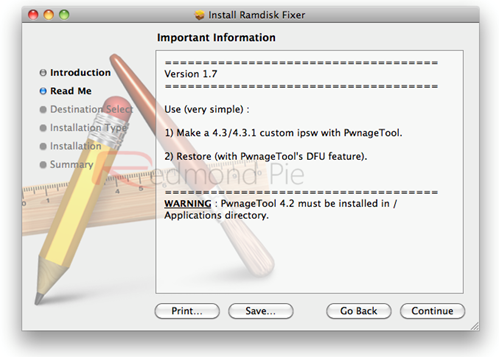 Step 4: Download Universal Ramdisk Fixer (part of the PwnageTool bundle package that you downloaded in Step 1 above) and simply install it as shown in the screenshots below. This is important because Ramdisk in the current version of PwnageTool is broken. 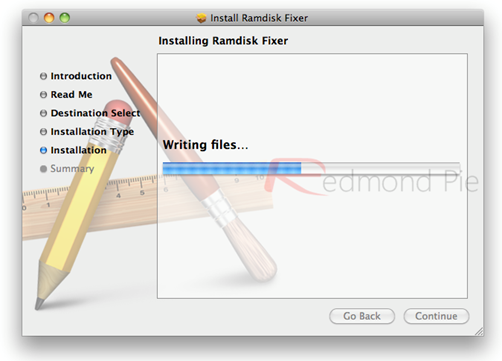 This Universal Ramdisk Fixer basically patches it correctly for iOS 4.3.1 firmware. Step 5: Download iOS 4.3.1 firmware. Move this file to your desktop. Step 11: Start iTunes, click on your iOS device icon from the sidebar in iTunes. Now press and hold left “alt” (option) button on Mac, or Left “Shift” button if you are on Windows on the keyboard and then click on “Restore” (Not “Update” or “Check for Update”) button in the iTunes and then release this button. Step 12: Now sit back and enjoy as iTunes does the rest for you. This will involve a series of automated steps. Be patient at this stage and don’t do anything silly. Just wait while iTunes installs the new firmware 4.3.1 on your iOS device. Your iOS device screen at this point will be showing a progress bar indicating installation progress. After the installation is done, your iOS device will be jailbroken on iOS 4.3.1. Last but not the least, since there is no untethered jailbreak for iOS 4.3.1 yet, we will have to boot it into a tethered jailbroken state. To do this, we will make use of a utility named “tetheredboot” as shown in the steps below. Step 14: First, we will need two files from the custom iOS 4.3.1 firmware namely: kernelcache.release.n90 and iBSS.n90ap.RELEASE.dfu. To do this, make a copy of your custom iOS 4.3.1 file that you created above, change the extension of this file from .ipsw to .zip, and then extract this .zip file. 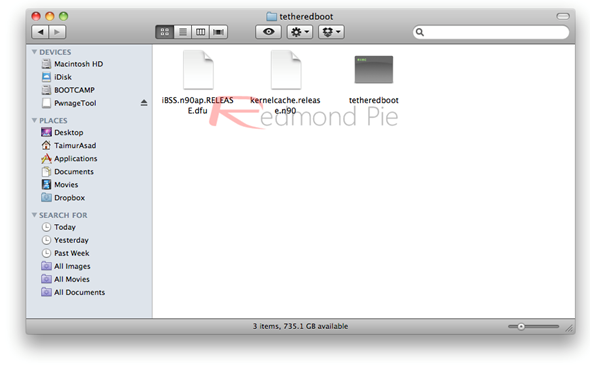 Move all these files, and tetheredboot utility to a new folder named “tetheredboot” on the desktop as shown in the screenshot below. Now wait for your device to boot, Terminal at this point will be showing “Exiting libpois0n” message. 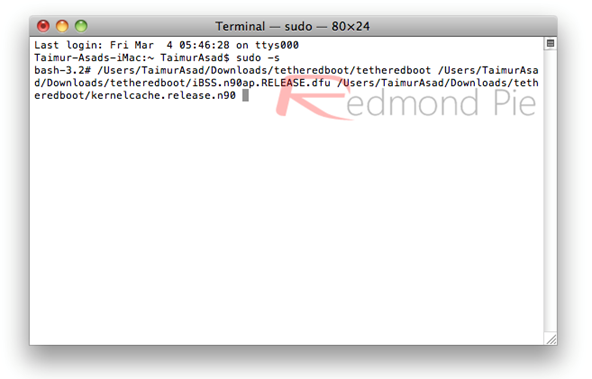 After a short while, your iPhone or iPod touch will be booted in a jailbroken tethered mode ! UPDATE 1: Instructions on how to jailbreak iPad 1G can be found here. UPDATE 2: Instructions on how to jailbreak iPod touch 4G can be found here. PwnageTool 4.2, Universal Ramdisk Fixer and tetheredboot utility.